Tribal Transportation Director and Tribal Member, Anthony Broncho, telling us about the bison and giving some of the history of the Shoshone-Bannock Tribes. Photo by Angela Parker, AICP, CFM. Start of the tour. Photo by Angela Parker, AICP, CFM. I was privileged to attend the 2018 Western Planner conference. This year, Western Planner partnered with the Tribal and Indigenous Planners Interest Group of APA. This was the first conference of its kind and was filled with excellent speakers and topics. Participants came from all over the western United States, from counties, cities, states and tribal organizations large and small. We even had attendees from Canada! My favorite part of the conference was the mobile tour. The Shoshone-Bannock Tribes Transportation Department hosted the tour and led by tribal member and Transportation Director Anthony Broncho. Mr. Broncho has a vast knowledge of the history of the Shoshone-Bannock Tribes. 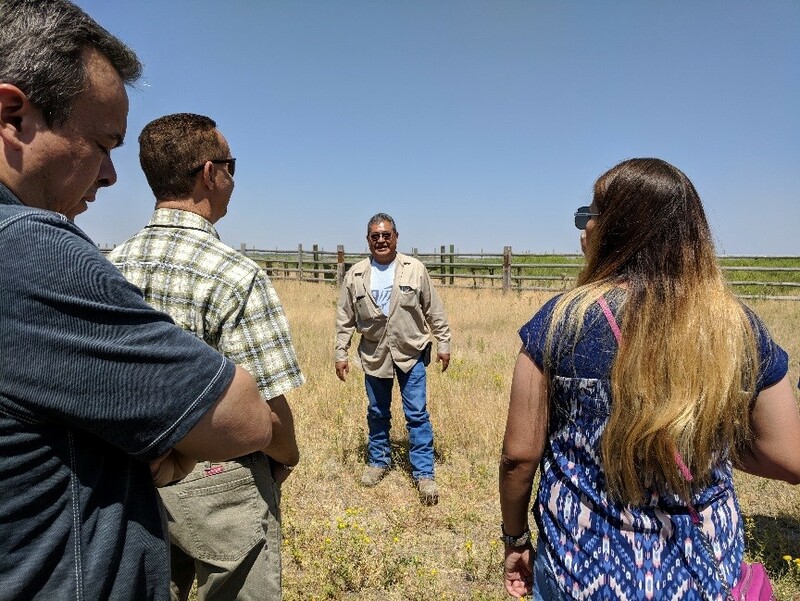 We hopped onto two buses operated by the Shoshone-Bannock Tribes Public Transit Program and headed off along paved, gravel and dirt roads, getting an inside glimpse of the workings of the reservation. Mr. Broncho took us to the original site of Fort Hall, now a stone monument and showed us where he used to participate in horse races as a kid, not far from the Fort Hall monument. Traveling through farmland on Fort Hall Indian Reservation. Photo by Angela Parker, AICP, CFM. I was amazed at the size of the reservation and the variety of tribally-owned and operated industries including cattle and bison ranching; growing and harvesting different crops (like alfalfa and potatoes); and operating a hotel, conference center, and casino. As part of our tour, we also saw part of the Oregon Trail and went on a hunt for the elusive bison that are part of reservation activities. Our buses took a trip down a dirt road that wound along the Snake River—no luck there. Next, we drove on gravel roads through farmland and up to the top of a hill overlooking the reservation -still no bison. At the top of the hill, Mr. Broncho shared more history, including the importance of preserving traditional hunting and fishing locations. He also shared information about telecommunications and public safety equipment that is positioned to enhance cell service and better track activity on the reservation. American Indian and Alaska Native tribes have deep historical connections and respect for their lands and traditional practices. It was an honor to tour the reservation, and to learn directly from Transportation Director Broncho about the history of the Shoshone-Bannock Tribes, and opportunities for continued collaborations with non-tribal partners that honor tribal values and goals. We never did find the elusive bison, but I came away from the tour with a better understanding of the Shoshone-Bannock people, their history and their way of life. Angela Parker, AICP, CFM, works for Big Horn County in Wyoming. Previously, she served as the Platting Officer with Fairbanks North Star Borough Community Planning in Alaska. She is the president of the Western Planning Resources, INC. Board of Directors.